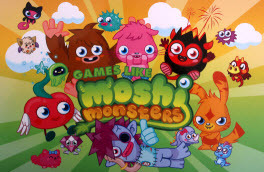 Games Like Moshi Monsters: Kids Virtual Worlds '+g+"
Moshi Monsters is a fun online world created by Mind Candy, where you can adopt your own monster, go on adventures, play games, solve puzzles, be creative, and communicate with friends in a safe environment. The site have over 80 million registered users in 150 territories worldwide. If you are a fan of virtual world games like Moshi Monsters and looking for more games with similar gameplay then find the recommendations for it below and don't forget to mention if we miss any games as we keep on updating this list. Club Penguin is a massively multiplayer online game (MMO) involving a virtual world containing a range of online games and activities, created by New Horizon Interactive. Players use cartoon penguin-avatars and play in a winter-set virtual world. Club Penguin was made available to the general public on October 24, 2005 and has since expanded into a large online community growing to the extent that by late 2007, it was claimed that Club Penguin had over 30 million user accounts. Neopets is a never ending online game where the players create and take care of their virtual pets called Neopets explore the virtual world of Neopia. Players can earn Neopoints(NP) through various means like playing games and selling items, these earned neopoints can be used to buy various virtual goods and services. Mara Pets is a free virtual pet game site where you can adopt a pet, care for it and play with it. Every player has their own dress up doll which represents them as they play. The game features about 21 fun-filled virtual worlds to explore, lots of mini games and battle games where you can battle against other players. CreatureBreeder is a popular online free breeding game. Here you can raise and breed unique creatures, trade them with other players and even design a farm for your creatures with lots of accessories. Fantage is a virtual world for children where they can play, socialize, and learn in a safe and exciting online environment! Users can explore the world with their own personal avatar, which they can customize by choosing distinctive features, hairstyles and clothing. Dizzywood,......if you can think of more, then don't forget to mention it in comments.